Special Containment Procedures: SCP-1056 is to be kept in a 50x50x50 cm 10-digit combination safe with biometric confirmation when not being used for testing. Only personnel involved in SCP-1056 research and testing may have access to the object. All tests require prior authorization by the Site Director or and by research staff with Level 3 clearance or higher. Tests on living subjects must be conducted in a secure testing facility meeting Level 2 containment guidelines to prevent modified subjects from escaping. All objects altered by SCP-1056 must be kept in Class E ablative storage for 48 hours after transformation. The creation of any object or organism over 200 kg must be approved by the Site Director. Description: SCP-1056 superficially resembles a burnished chrome kitchen timer with numbers ranging from 0.25 to 4.00 and an activation button on the right-hand side. A 1x1.25 meter wire mesh platform is connected to the device by a 3 meter insulated molybdenum carbide wire coated with molybdenum disulfide and an unidentified organometallic complex; the mesh is capable of folding into a 27 x 35 cm square. When the device is set to a number and the side button is pushed, any objects in direct contact with the wire mesh platform will scale up or down in size by a factor corresponding to the number setting. The device was recovered by SCP personnel following reports of unusual behavior among students at ████ High School in ████, PA. School officials began an investigation when teachers reported that a number of students were behaving unusually. Specifically, the students displayed significantly impaired language skills, abnormally poor attention span, long-term memory, and impulse control. Medical examination of the students revealed the presence of numerous vascular and nervous system abnormalities. Foundation personnel recovered the device at the home of one of the students, who had presumably been using it for recreational purposes. The only indicator of the manufacture or distribution of the device is a 4x1 cm imprint on the bottom of the device reading "THE FACTORY”. All electronic components are of generic make. A 5.00 cm stainless steel cube scaled up by 3.00. The physical appearance of the cube is perfectly maintained but the microstructure is altered. The manner in which objects are resized appears to follow a set of rules that varies depending upon the complexity and function of the object. Simple inanimate objects such as minerals, metals, and plastics scale up or down to precisely (to four significant figures) the scale indicated without any regard to molecular or microscopic scale. 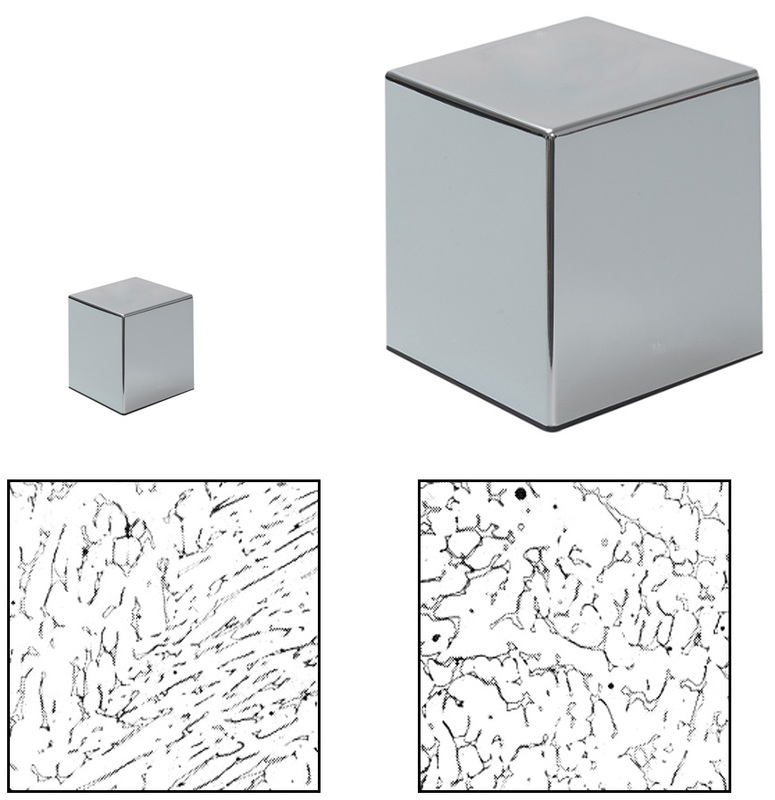 For instance, a 5.00 cm stainless steel cube on the 3.00 setting scaled up to a 15.01 cm cube that was indistinguishable in molecular composition from the original cube but that differed on a microstructural level; average grain size on the two cubes was identical, and individual grains on the small cube did not scale up to the large cube. SCP-1056 appears to scale complex devices and biological organisms with some attempt to maintain the functional properties of the object or organism. For instance, the microprocessors of electronic devices are often modified if the altered scale would result in nonfunctional transistor gates, insufficient power, or excessive heat build-up. Devices that have been scaled down often have a reduced number of transistors and may demonstrate floating point errors. While all but the most complex mechanical objects scale relatively well, electronics are often rendered nonfunctional when scaled below 0.50 and above 3.00 of their original scale. Living organisms that have been resized by SCP-1056 retain their basic anatomical structure but often experience significant reorganization of the circulatory, pulmonary, and especially nervous system. Cell size and composition remain identical to that seen in the original organism, but the number of cells increases or decreases proportionally to the change in volume. The only exception to this observation is the nervous system, where the average neuron may increase or decrease up to 25% in linear size (thus, potentially becoming slightly under half or over twice the original volume) with negligible effects on function. Interestingly, SCP-1056 appears to “split the difference” with single-celled organisms, slightly altering the average cell size and also altering the overall cell population. Humans can be resized by SCP-1056 as low as 0.50 and as high as 1.75 with minimal change in function. Shrinking humans often results in increased gyrencephaly (folding) of the cerebral cortex, a reduction in average neuron volume, and a decrease in white matter. This appears to preserve cognitive function down to 0.50. Attempts to scale humans below 0.50 results in a substantial decrease in cognitive function, language comprehension, and short- and long-term memory, indicating that this is the minimal size required for human-like intelligence in a mammalian brain. Humans scaled above 1.25 demonstrate slowed reaction speeds, a reported increase in creativity, and substantial improvements to long-term memory. Scaling beyond 1.50 greatly increases the risk of cardiovascular disease, stroke, aneurism, and renal failure. The scaling of any organism beyond 3.00 is highly discouraged. The mechanism by which SCP-1056 institutes these changes in scale is currently unknown. High-speed video footage of transformations up to 20,000 fps indicate that the transformation is nearly instantaneous, as there is no apparent transition between forms. Interestingly, there are no apparent effects of atmospheric displacement, even when the volume created or destroyed is very large. In a minority (roughly 8%) of cases, an object altered by the device experiences a material instability and begins to undergo atomic decay within 36 hours of alteration. Living organisms and other objects with relatively low metal content have a considerably lower (roughly 3%) chance of undergoing decay. This decay produces significant heat and energy – approximately 150 gigajoules per kilogram - around six orders of magnitude less than typical matter-antimatter decay but sufficiently high to render frequent or high-mass transformations inadvisable. Result: Functional 0.75 scale calculator. The calculator was successfully returned to a 1.00 scale using the 1.33 setting. Repeated transformations between the two settings does not appear to alter the basic function, appearance, or internal composition of the calculator. Result: Nonfunctional 0.25 scale calculator. The power button of the calculator turns it on, but it is incapable of performing accurate calculations. Most calculations result in either incorrect results or an ERR signal. Return of the calculator to normal scale using the 4.00 setting did not return function to the device. Internal analysis indicates loss of fine details, including transistor number and LCD resolution, in the device. Object: 1 kg bar of 22 carat gold bullion. Result: 64 kg bar of 21 carat gold bullion with minor molybdenum impurities. Object: 35 one ounce (28.35 gram) “Silver Eagle” bullion coins. Result: 99 bullion coins weighing 80.18 grams apiece. The increase in total mass seems to be evenly split between increasing the average size of the coins and increasing the total number of coins. 40.25 hours after the transformation, the coins began to emit electromagnetic radiation, eventually emitting high levels of heat and ionizing radiation. The mass of silver was stored in the high explosives test chamber at Site 40 until the mass had completely dispersed 20 hours later. This resulted in extensive damage to the test chamber and the treatment of four researchers for radiation poisoning. Object: Human subject D-3202, a 52 year-old male, 175 cm tall and weighing 90.3 kg. Result: The subject scaled up approximately twofold to 341 cm tall and weighing 719.6 kg. Mental and physiological functions appear normal. Reaction times are slightly lower than normal and required caloric intake is only 50% of what would be expected, given the nearly eightfold increase in mass. The subject performs extremely well on long-term memory tests, perhaps owing to increased brain mass. Resting heart rate is 45 bpm and systolic pressure is 165 mm Hg (versus 132 before the transformation). Six days after the transformation, the subject experienced vascular irregularities leading to moderate swelling in the distal limbs, followed by intermittent bouts of confusion, spotted vision, blurred vision, and tinnitus. The subject died from respiratory arrest caused by a massive brainstem aneurysm 22 days after the transformation. Object: Human subject D-3315, a 36 year-old female, 163 cm tall and weighing 55.0 kg. Result: The subject scaled down approximately twofold to 81 cm tall and weighing 7.0 kg. Mental and physiological functions appear normal. There was no significant difference in tests of general intelligence, short- and long-term memory, and spatial reasoning administered before and after the transformation. MRI scans indicate increased folding in the cerebral cortex and an overall decrease in white matter. Resting heart rate is 98 bpm and systolic pressure is 88 mm Hg (versus 115 before the transformation). The subject’s cardiovascular system was slightly simplified in a manner similar to that seen in smaller primates. Twenty-eight days after the transformation, no obvious health or behavioral anomalies were observed and the subject was returned to her original size. Object: Human subject D-3315 from experiment SCP-1056-6, a 36-year old female, 81 cm tall and weighing 7.1 kg. Result: The subject scaled back up to her original size of 163 cm tall with a weight of 55.7 kg. Mental and physiological functions appear normal. Cognitive tests indicate a slight but significant improvement in short- and long-term memory and a slight decrease in reaction time. It is hypothesized that these cognitive irregularities could compound or change with repeated use of the device. The cardiovascular system appears modified from the shrunken version to support the larger body but is not identical to the original vascular pattern, indicating that the device “improvises” solutions to physiological problems anew with each transformation rather than reverting to old forms. Object: Bacterial culture of species E. coli in LB medium on a 13 cm petri dish. Result: The Petri dish scaled up to 52 cm and the bacterial colonies increased in volume roughly sixty-fourfold while maintaining their original morphology. Microscopic analysis of the colonies reveals that the average size of the bacteria had increased by a factor of 2.2 to 7 microns in length with the remaining increase in mass owing to an increased number of bacterial cells. Samples cultured from these colonies maintain an increased size, generally stabilizing at 6 microns in length after 20 replication cycles. PCR analysis reveals several point mutations in the bacterial genome, such as in the rodZ gene, leading to the bacterium’s generally increased size.